If you like a fun luggage tag then think about getting one with a letter on it like the one with the K on the picture. 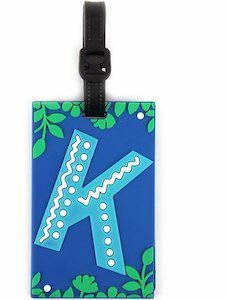 You can get this luggage tag with many different letters and all comes in a different look so none will look like the blue K besides the K luggage tag. On the back the luggage tag is just plain in color with an ID pocket on it so that you can keep changing your address . A fun bag tag like this is great for on your suitcase or you everyday backpack and that way you never really have to loose your luggage again. This entry was posted in Uncategorized and tagged letter, luggage tag. Bookmark the permalink.